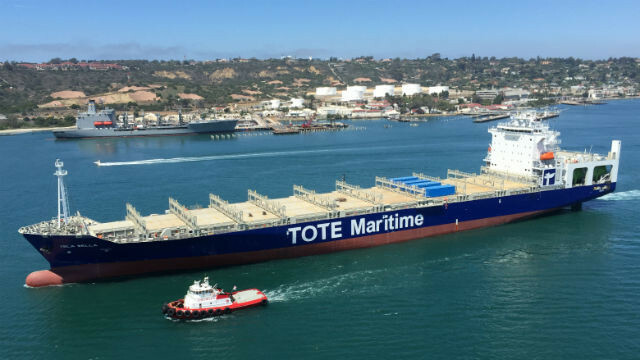 The world’s first container ship to be powered by liquefied natural gas was delivered Friday by General Dynamics NASSCO of San Diego to New Jersey-based TOTE Maritime. The 764-foot-long Isla Bella was handed over to its operator nearly two months ahead of schedule, according to NASSCO. The companies said the vessel and its sister ship, the Perla Del Caribe, will dramatically reduce carbon emissions and improve fuel efficiency compared to conventionally powered boats. The Perla Del Caribe has been launched, but not yet delivered. NASSCO officials said they worked together with TOTE, the American Bureau of Shipping and U.S. Coast Guard throughout the process, from design approval to construction and commissioning the ship. The Isla Bella and its sister ship will operate between Jacksonville, Florida, and San Juan, Puerto Rico, for TOTE, which stands for Totem Ocean Trailer Express.